This recipe was inspired by all of my favorite foods just thrown into one dish. It only just so happened to be gluten free as well. I love apple pie, I love cornbread, and I love french toast. I got the idea to replace the flour in the crust with cornmeal because I thought it would add a distinct flavor and texture. I also wanted to add honey to the mix because nothing is more comforting than that honey butter that is smeared all over the top of warm cornbread fresh from the oven. Following that train of thought, I figured having all of the juices and spices dripping into the crust from the filling would be the most orgasmic sensation in my mouth. Since the crust wasn’t holding well on its own, instead of trying to roll it out and get it on top of the pie in one piece, I decided to turn the excess into a crumble topping. I couldn’t just put it on top as is, though. It needed a little something extra. 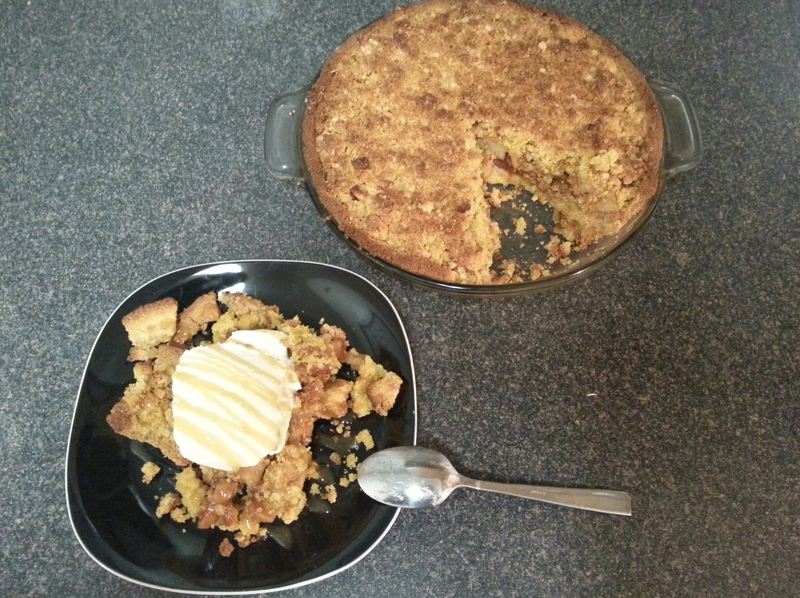 I figured the oats and turbinado sugar would add the perfect crunch to the pie. Before I put the topping on, I placed it in the freezer to chill while I dealt with the filling. This gave it a chance to firm up the butter a bit, which is always ideal when baking with butter. When everything was pulled together and in the oven, my apartment instantly started to smell like the apple pie cornbread of my dreams. Now, I love this recipe, but if pies aren’t your thing and crumbles are, just grab a baking dish, butter the bottom, pour the filling in, and then top with the crumble. It’s super delicious either way. One of These Days I’ll Get a Picture With ALL of the Ingredients Actually Listed. 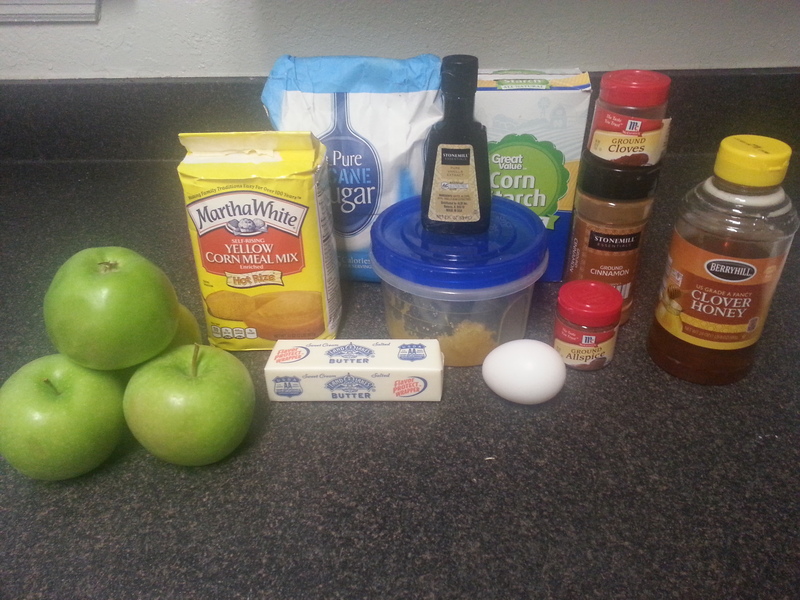 Missing: Oats, Turbinado Sugar, Baking Powder, and an Apple. *I didn’t have to add salt to the cornmeal that I had because it was already in there. Just double check to make sure you aren’t overdoing it on the salt. That’s why I used unsalted butter. **I always use granny smith apples (just like everybody else) because we always have them in the house. We binge eat them like candy and they never last long. Combine melted butter and honey in a mixing bowl fixed with the paddle attachment. Beat mixture on high for 30 seconds. Add the egg white to the bowl and beat for another 30 seconds. Reduce mixing speed to low and pour in the cornmeal, baking powder, and salt. With the mixer still running, add in the water. 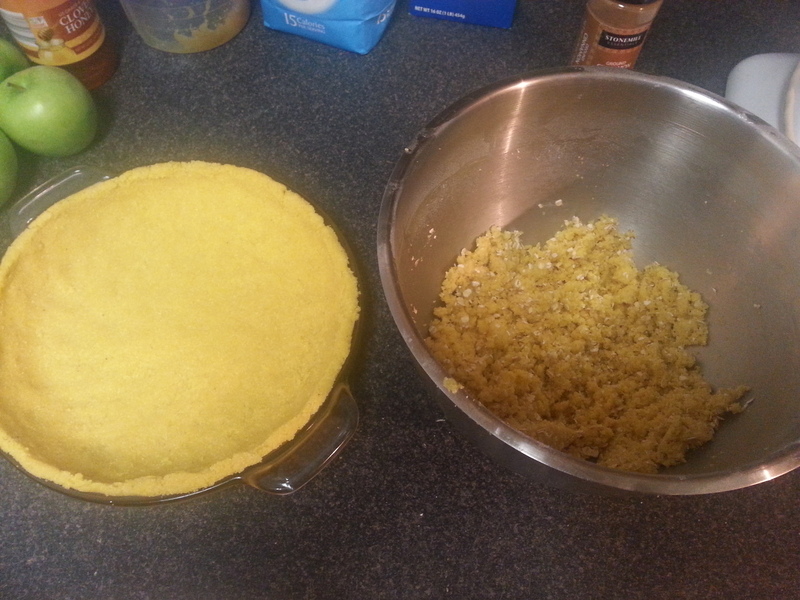 Place enough of the mixture into your pie pan to create a substantial crust on the bottom and sides of the pie pan. * Press the crust down to create an even layer all throughout. ** When done, set aside. With the extra crust in the mixing bowl, add the oats, turbinado sugar, and diced butter. Turn the mixer on for 10 seconds. Take your crumble topping and place it in the freezer while you create the filling. 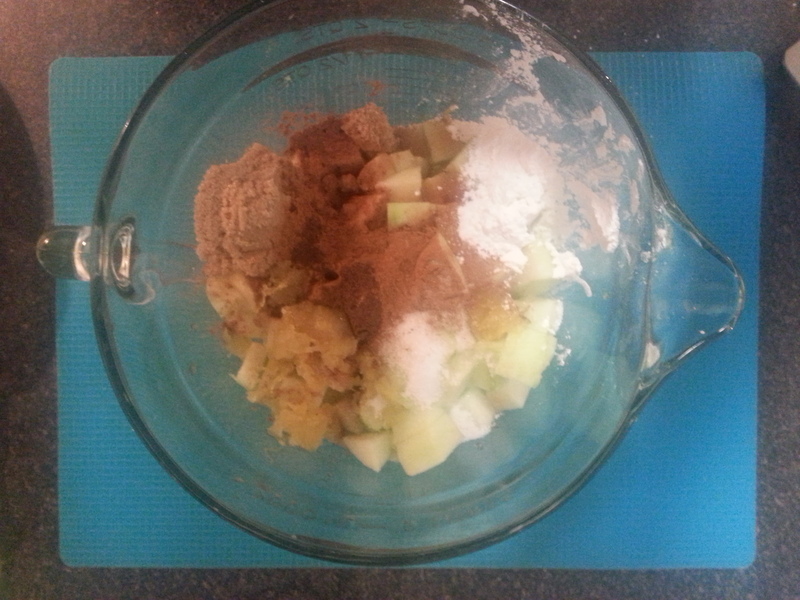 Add all of the filling ingredients into a bowl and mix until combined. Grab your crumble topping from the freezer and cover the top of the filling. Place the pie in the oven, on top of the baking sheet that’s already in there. After those 45, remove baking sheet from under the pie pan and place bake in the oven. Turn off the oven and let the pie sit in oven for another 10 minutes. 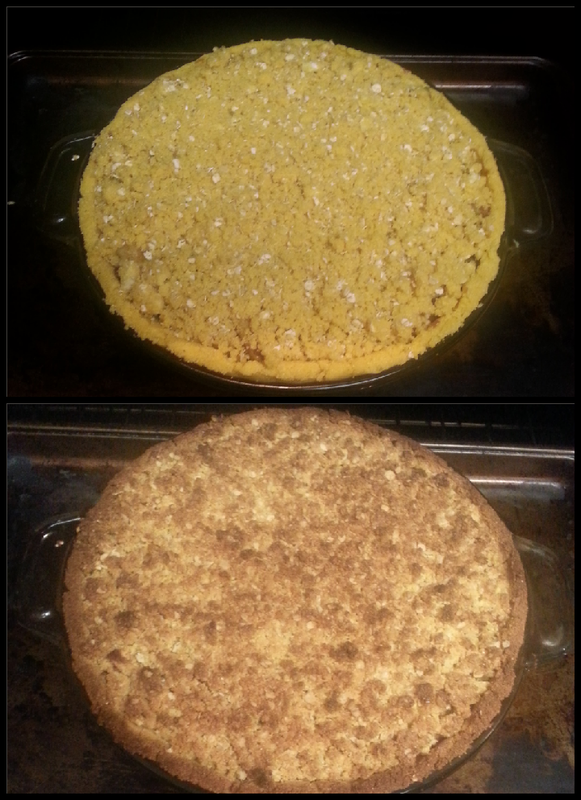 My Crust was too High in the Pie Plate, and if You Look Closely at the Bottom Picture, You Can See it’s Burnt. I Just had to Remove it. It Was Still Super Delicious. Just Don’t Make The Same Mistakes I Did! *Don’t bring the crust too high up because the tips that are sticking out will burn (since there’s no moisture from the filling keeping it safe), and that isn’t delicious. Keep it about a centimeter below the pie pan edge so you can keep that crust edge tucked in and get that filling just above it. **Make sure to make your crust as thin as possible. A thick crust using cornmeal will make for a more crumbly base. If you make the crust thinner, you give the moisture of the filling a chance to permeate the bottom layer, solidifying it and making it less likely to fall apart. And watch out for the corners of the pie pan! People have the tendency to ignore the corners when it comes to the crust and that’s a big No-No. Pay extra attention to the corners because if they’re too thick, the crust will become impossible to cut and it will lead to your pie pieces breaking. The Final Product! Yay! Of Course I Put Ice Cream on Top of it. What Kind of Person do You Think I am?